Happy Days Entertainment Ltd is a family based entertainment company based in the North East of England. For over 20 years, we have proudly entertained children young and old and have an established reputation for providing high quality children’s entertainment and adult parties at affordable prices. We are one of few professional entertainment companies who are able to cater separately for adults as well as children. We listen to our customer feedback and ensure that we provide the latest available party equipment to venues. 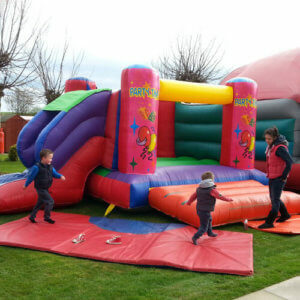 Our rides, bouncy castles and soft play selection are one of the largest available! Our commitment to health and safety is reflected in our public liability insurance which covers up to £5 million. All of our equipment is regularly checked by our qualified staff before and after any use. All of our employees have up to date Disclosure and Barring Service (DBS, originally CRB). We cater nationally for large corporate events as well as family celebrations. Our commitment to our customers and their satisfaction means that when you book your event with Happy Days Entertainment you can look forward to a hassle free high quality bash for your V.I.P’s.